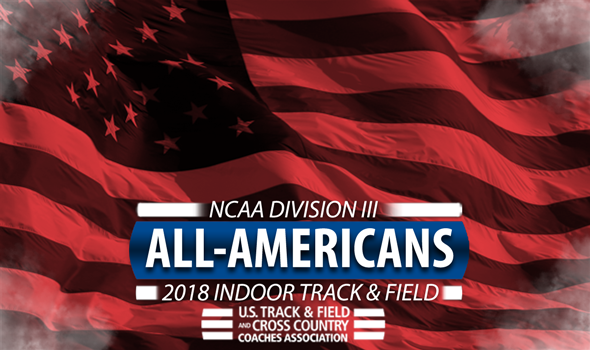 NEW ORLEANS – All-Americans for the 2018 NCAA Division III Indoor Track & Field season were announced Monday by the U.S. Track & Field and Cross Country Coaches Association (USTFCCCA). Athletes of member institutions who finished in the top-8 of their respective individual events and relays at the 2018 NCAA Division III Indoor Track & Field Championships this past weekend in Birmingham, Alabama took home All-American honors. No men’s team had more All-Americans than North Central (Ill.). The Cardinals, who finished runner-up to Mount Union, earned 14 honors from 12 different athletes. Rowan and UW-Eau Claire both tied with 12 All-Americans. The Profs had nine men chip in for those awards, while the Blugolds did so with 11 (Darin Lau was the only man to double up for UW-Eau Claire). The Purple Raiders, who were the team champion, earned eight All-American honors. Mount Union spread its honors across five events – the 60, 60 hurdles, 4×400, pole vault and shot put. MIT and Williams were the only women’s programs with 10 or more All-Americans. The Ephs had 10 women combined for 12, while the Engineers pulled together for 10. UMass Boston, the team champion, valued quality over quantity. The Beacons only had five All-Americans, but scored 46 points from those recipients. Wadeline Jonathas became just the third athlete in history to win four individual event titles at a single NCAA meet, joining the legendary Jesse Owens and Christopher Newport’s Sheila Trice. Jonathas won the 60, 200, 400 and long jump. Taylor Driggers finished third in the long jump for UMB’s six other points. See below for a full list of NCAA Division III Indoor Track & Field All-Americans.